[There are a number of features of Jesus which Christians think are totally unique (e.g. 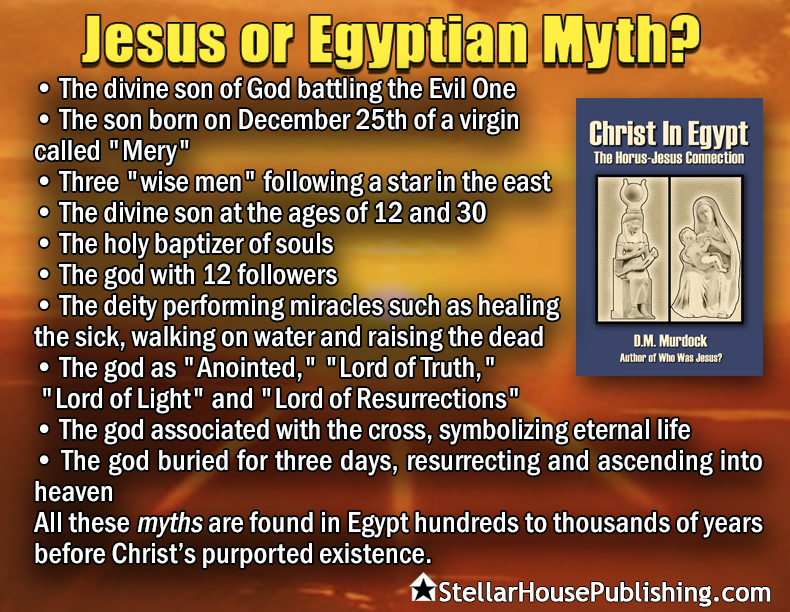 virgin birth, rising from the dead, etc); but in fact other "Gods” older than Jesus had various similar features. Below is what a non-Christian found when he dug into the claims that Jesus is not totally unique as Christians claim. Drawing © Stéphane Beaulieu after Pope 1977: Plate XI. I recently watched the documentary Zeitgeist (Part 1) as well as Bill Maher’s movie Religulous. 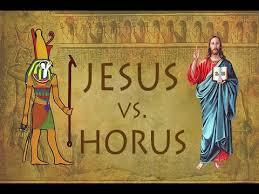 Both made mention of claims often made that there are many stories that predate Jesus but have striking parallels. I decided to follow up on these claims and see what kind of information was out there to substantiate these assertions. 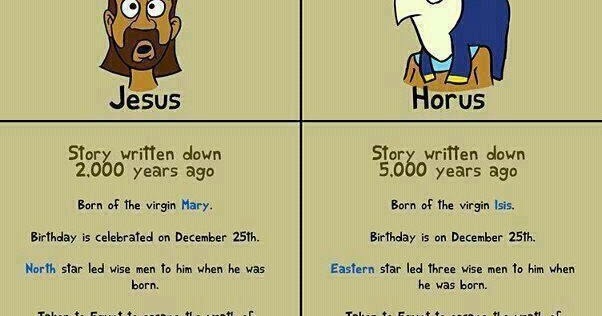 I found several websites run by Christians who obviously disputed all claims of any parallels to the life of Jesus. I also found several interesting books on the subject, such as The World’s Sixteen Crucified Saviors: Christianity Before Christ by Kersey Graves, and The Christ Conspiracy, and Suns of God: Krishna, Buddha and Christ Unveiled by Acharya S.
As a non-christian, I am approaching this topic purely as an interested observer. I am assuming half of the people who read this will automatically say the claims are false and the other half will say they are true. The truth I found is that it is difficult to know for sure. Jesus responded: “…begone, Satan!” (Matthew 4:10). Both strove to establish a kingdom of heaven on earth. According to the Somadeva (a Buddhist holy book), a Buddhist ascetic’s eye once offended him, so he plucked it out and cast it away. Jesus said: “If your right eye causes you to sin, pluck it out, and throw it away;.” (Matthew 5:29). According to Bhagavata Purana some believe that Krishna was born without a sexual union, by “mental transmission” from the mind of Vasudeva into the womb of Devaki, his mother. Christ and Krishna were called both God and the Son of God. Both were sent from heaven to earth in the form of a man. Both were called Savior, and the second person of the Trinity. Krishna’s adoptive human father was also a carpenter. A spirit or ghost was their actual father. Krishna and Jesus were of royal descent. Both were visited at birth by wise men and shepherds, guided by a star. Angels in both cases issued a warning that the local dictator planned to kill the baby and had issued a decree for his assassination. The parents fled. Mary and Joseph stayed in Muturea; Krishna’s parents stayed in Mathura. Both Christ and Krishna withdrew to the wilderness as adults, and fasted. Both were identified as “the seed of the woman bruising the serpent’s head.” Jesus was called “the lion of the tribe of Judah.” Krishna was called “the lion of the tribe of Saki.” Both claimed: “I am the Resurrection.” Both were “without sin.” Both were god-men: being considered both human and divine. Both performed many miracles, including the healing of disease. One of the first miracles that both performed was to make a leper whole. Each cured “all manner of diseases.” Both cast out indwelling demons, and raised the dead. Both selected disciples to spread his teachings. Both were meek, and merciful. Both were criticized for associating with sinners. Both celebrated a last supper. Both forgave his enemies. 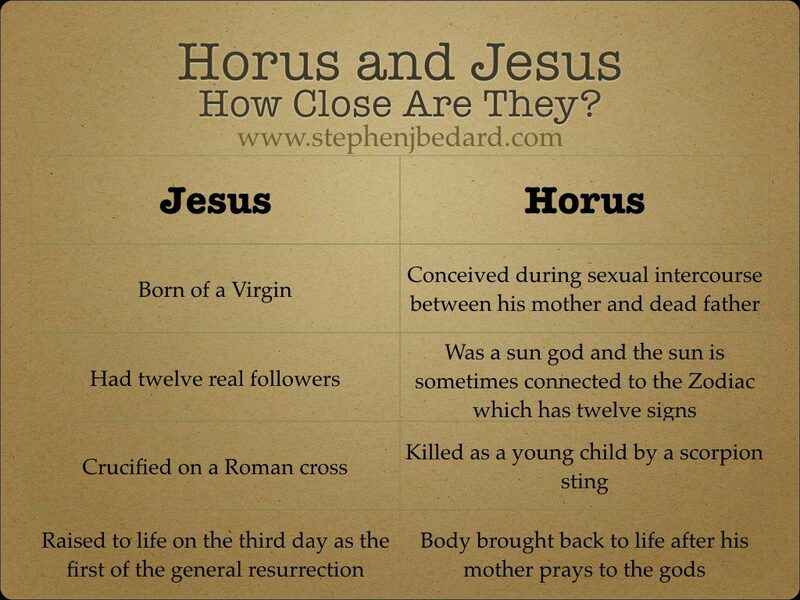 Both were crucified and both were resurrected. Homeric tales about Odysseus emphasize his suffering life, just as in Mark Jesus said that he, too, would suffer greatly. Odysseus is a carpenter like Jesus, and he wants to return his home just as Jesus wants to be welcomed in his native home and later to God’s home in Jerusalem. Odysseus is plagued with unfaithful and dim-witted companions who display tragic flaws. They stupidly open a magic bag of wind while Odysseus sleeps and release terrible tempests which prevent their return home. These sailors are comparable to Jesus’ disciples, who disbelieve Jesus, ask foolish questions, and show general ignorance about everything. It’s amazing that either Odysseus or Jesus ever manage to accomplish anything, given the companions they have, but this simply demonstrates the power and ability of the one true leader who has a divine mandate to lead the people out of darkness and into a brighter future. Romulus is born of a vestal virgin, which was a priestess of the hearth god Vesta sworn to celibacy. His mother claims that the divine impregnated her, yet this is not believed by the King. Romulus and his twin brother, Remus, are tossed in the river and left for dead. (A “slaughter of the innocents” tale which parallels that of Matthew 2:13-16). Romulus is hailed as the son of god. He is “snatched away to heaven” by a whirlwind (It is assumed that the gods took him), and he makes post mortem appearances. In his work Numa Pompilius, Plutarch records that there was a darkness covering the earth before his death (Just as there was during Jesus’ death according to Mark 15:33). He also states that Romulus is to be know afterwards as ‘Quirinus’; A god which belonged to the Archiac Triad (a “triple deity” similar to the concept of the Trinity). Hera tries to kill Heracles as an infant by sending two serpents after him, yet Heracles survives by strangling them. This parallels Herod’s slaughter of the innocents in an attempt to kill Jesus (Matthew 2:13-16). Zoroaster was born of a virgin and “immaculate conception by a ray of divine reason.” He was baptized in a river. In his youth he astounded wise men with his wisdom. He was tempted in the wilderness by the devil. He began his ministry at age 30. Zoroaster baptized with water, fire and “holy wind.” He cast out demons and restored the sight to a blind man. He taught about heaven and hell, and revealed mysteries, including resurrection, judgment, salvation and the apocalypse. He had a sacred cup or grail. He was slain. His religion had a eucharist. He was the “Word made flesh.” Zoroaster’s followers expected a “second coming” in the virgin-born Saoshynt or Savior, who is to come in 2341 AD and begin his ministry at age 30, ushering in a golden age. Thanks I’ll download and watch the video.